We’d love your help. 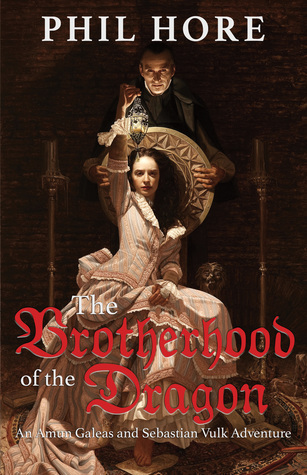 Let us know what’s wrong with this preview of The Brotherhood of the Dragon by Phil Hore. "It was not that Mr Fortey was particularly loved, but that he died in such a horrible way, and in the presence of almost the entire household. We must have been only a few feet away, yet no one heard or saw anything. If it could happen to a strapping veteran like the footman, it could happen to any of us." Phil Hore’s debut n Strange things are happening at Stamford House. To ask other readers questions about The Brotherhood of the Dragon, please sign up. The first in a trilogy of novels by Australian author Phil Hore, The Order of the Dragon introduces us to two very different characters: the learned, dryly humorous Amun Galeus, and his hulking friend Sebastian Vulk. While this might sound like standard bickering buddies fare, the novel doesn’t descend into cliché: it’s a fun, pulp horror piece that starts off slow, but once it hits its stride, rockets like a freight train. Fans of Mark Frost’s The List of Seven and The Six Messiahs will find a The first in a trilogy of novels by Australian author Phil Hore, The Order of the Dragon introduces us to two very different characters: the learned, dryly humorous Amun Galeus, and his hulking friend Sebastian Vulk. While this might sound like standard bickering buddies fare, the novel doesn’t descend into cliché: it’s a fun, pulp horror piece that starts off slow, but once it hits its stride, rockets like a freight train. Fans of Mark Frost’s The List of Seven and The Six Messiahs will find a great deal to like in The Order of the Dragon. There’s a great deal of action, not to mention blood, with enough swordfights and gunplay to fill three novels, let alone one. Elements of whodunit and why are sprinkled evenly throughout, deepening the mystery. The Order of the Dragon is a fun start to what promises to be an exciting new series, and I’m looking forward to the second book. An intriguing book, I enjoyed the mix of history and supernatural. It had some interesting ideas, and I'm quite looking forward to reading the next in the series. This fantasy novel takes place at the end of the nineteenth century and includes an ancient first-person narrator investigating crimes at Stamford House in London. Along the way we encounter the complicated Stamford family, a werewolf, vampires, Bram Stoker, Sir Arthur Conan Doyle, Winston Churchill, Jack the Ripper and other less-known historical figures. There's a lot of fighting, a huge body count and supernatural goings-on. It all reads like a pulp novel of the 30s or 40s and, although based on historical events in many examples, the fiction and factual stuff don't mix well. it's just not a particularly brilliant read. I can't recommend it. I received a free copy of this book in exchange for an honest review.